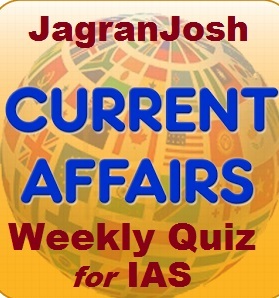 Find out the current affairs quizzes created on a daily basis during the whole week based on the recent events. Various important events happened in India and around the world have been covered in the current affairs quizzes form. Such IAS questions with explanation are very important for IAS Prelims Exam 2017. Current affair as one of the key sections of IAS Exam and it needs a consistent study with a great thrust during IAS preparation. A better practice of current affairs quiz enhances not only the chances of scoring good marks in IAS Prelims Exam but it also gives an edge to the preparation of IAS Mains Exam. Here, we have compiled the current affairs quizzes created from 13th May to 19th May 2017, crucial for the upcoming IAS Prelims Exam 2017. 1. Recently, the World Health Organization (WHO) has declared an Ebola outbreak in which of the following country? The World Health Organization has declared an Ebola outbreak in the Democratic Republic of Congo (DRC), Africa. Of the nine people suspected to have contracted the deadly virus, three have already died. More than 11,000 people died in the Ebola outbreak in West Africa in 2014-2015, mainly in Guinea, Sierra Leone and Liberia. The last outbreak in the DRC was in 2014 and killed more than 40 people. The region affected lies 1,300 km north-east of Kinshasa, close to the border with the Central African Republic. This outbreak will be worrying for communities in this remote part of the DRC and health workers. 1) e-Krishi Samvad is a unique platform that will provide direct and effective solutions to the problems faced by farmers. 2) People can directly connect to the ICAR website and get the appropriate solutions from the subject matter specialists. The Union Ministry for Agriculture and Farmers Welfare launched the e-Krishi Samvad and specified that it is internet-based interface and a unique platform that will provide direct and effective solutions to the problems faced by farmers and stakeholders in the agriculture sector. The People can directly connect to the ICAR website and get the appropriate solutions from the subject matter specialists and institutes through web or SMS. Stakeholders can upload photographs related to diseases of the crops, animals or fishes for diagnostics and remedial measures instantly from the specialists. E-Krishi Samvad is useful to get information pertaining to welfare and development of agricultural stakeholders. 1) GM mustard would be the second transgenic food crop to be allowed for commercial cultivation in Indian fields after BT Brinjal. 2) Dhara Mustard Hybrid (DMH -11) uses a system of genes from soil bacterium that makes mustard better suited to hybridization. Recently, the Genetic Engineering Appraisal Committee (GEAC), India's apex regulator for genetically modified seeds cleared the GM mustard for environmental release and use in farmer fields. However, the approval is contingent on a final nod from Environment Ministry. GM mustard would be the first transgenic food crop to be allowed for commercial cultivation in Indian fields and would be a gateway for several genetically-modified food crops in India. Bt Brinjal was cleared by the Committee in 2010 but was blocked by then Environment Ministry. Dhara Mustard Hybrid (DMH -11), the transgenic mustard in question, has been developed by a team of scientists at Delhi University under a government-funded project. In essence, it uses a system of genes from soil bacterium that makes mustard generally a self-pollinating plant better suited to hybridisation than current methods. 1) The strain S. agalacticae is a Gram-positive bacterium that causes life-threatening diseases such as bacterial sepsis and meningitis in newborn babies and several diseases including pneumonia in non-pregnant adults. 2) This antibiotic-resistant bacterium, E. faecium causes urinary tract infection and surgical site infections. Which of the following statement(s) is/are correct? Bacteria have specific surface proteins which are used for binding to host cells. Scientists at the Centre of Advanced Study in Crystallography and Biophysics, at the University of Madras, have succeeded in characterising such surface proteins of some pathogenic bacteria including Streptococcus agalactiae and Enterococcus faecium. Infection by both of these bacteria can have deadly effects on humans. The strain S. agalacticae is a Gram-positive bacterium that causes life-threatening diseases such as bacterial sepsis and meningitis in newborn babies and several diseases including pneumonia in non-pregnant adults. The group has characterised the structure and binding properties of its surface proteins. But the more exciting discovery is the structure of the SgrA protein of E. faecium. This antibiotic-resistant bacterium causes urinary tract infection and surgical site infections. Catheter-induced infections could also be caused by this strain as its surface protein SgrA is known to be able to bind to abiotic surfaces, such as polystyrene. 5. Recently, India and Israel have developed which of the following longer-range surface-to-air system after Barak 8? India carried out a test firing of a SPYDER quick-reaction surface-to-air missile (QRSAM). The test took place on Thursday from a test range in the eastern Indian state of Odisha, where India conducts most of its missile testing. The SPYDER, which stands for Surface-to-air PYthon and DERby, is developed by Israel’s Rafael Advanced Defence Systems. India and Israel concluded a deal for the missiles in 2009. Moreover, India and Israel have jointly developed the Barak 8, a longer-range surface-to-air system that may have a range of up to 100 kilometres. Israel Aerospace Industries (IAI) and India’s DRDO collaborated on the Barak. I. The primary goal of the Skills and Livelihoods in Sagarmala is to meet the exact skill needs of industries in the port and the maritime sector. II. The Skills and Livelihoods in Sagarmala will provide the coastal communities right skills for better opportunities emanating from the large scale impact of Sagarmala projects. For skills development of youth in coastal areas, the Ministry of Shipping signed a MoU with the Ministry of Rural Development in New Delhi today. The MoU is for convergence of the Ministry’ prestigious project Sagaramala and Ministry of Rural Development’s flagship programme Deen Dayal Upadhyay Grameen Kaushalya Yojana (DDU GKY). The primary goal of the Skills and Livelihoods in Sagarmala is to meet the exact skill needs of industries in the port and maritime sector and provide the coastal communities right skills for better opportunities emanating from the large scale impact of Sagarmala projects. It is expected that the close involvement of the coastal communities in Sagarmala will make them contributors in the economic development and will ensure the inclusive growth of the coastal districts of the country. DDU-GKY is currently being implemented in 28 states and has over 654 training centres in 522 projects, in partnership with over 261 training partners conducting training across 39 sectors, and over 329 job-roles. So far a total of 4.54 lakh candidates have been skilled and 2.31 lakh candidates provided jobs. 7. In pursuance of India’s ‘Act East Policy’, which of the following Indian Naval Ships are on an overseas deployment to the South East Asia and Southern Indian Ocean? In pursuance of India’s ‘Act East Policy’, Indian Naval Ships Shivalik and Jyoti are on an overseas deployment to the South East Asia and Southern Indian Ocean. The ships would be on a port visit to Kuantan from May 14 to May 19, 2017. The visit of the Indian Naval Ships seeks to underscore India’s peaceful presence and solidarity with friendly and harmonious countries towards ensuring good order in the maritime domain and to strengthen existing bonds between India and Malaysia. The two countries share a rich history and a strategic relationship. A number of bilateral agreements exist between the two countries in various spheres. I. India and Chile had earlier signed a Preferential Trade Agreement (PTA) on March 8, 2006, which came into force with effect from August 2007. II. Chile is the fourth largest trading partner of India in LAC region after Brazil, Venezuela and Argentina. III. The expanded PTA has a wider coverage wherein Chile has offered concessions to India on 1798 tariff lines with Margin of Preference (MoP) ranging from 30%-100% and India has offered concessions to Chile on 1031 tariff lines at 8-digit level with MoP ranging from 10%-100%. India and Chile have entered into another milestone in their trade relations as an agreement on the expansion of India-Chile PTA which was signed on 6th September 2016 is finally being implemented on 16th May 2017. The Union Cabinet had approved the expansion of PTA in April 2016. The expanded PTA would immensely benefit both sides as a wide array of concessions has been offered by both sides on a number of tariff lines which will facilitate more two-way trade. India and Chile had earlier signed a Preferential Trade Agreement (PTA) on March 8, 2006, which came into force with effect from August 2007. The original PTA had a limited number of tariff lines wherein both sides had extended tariff concessions to each other. India’s offer list to Chile consisted of only 178 tariff lines whereas Chile’s offer list to India contained 296 tariff lines at the 8-digit level. 9. Recently which of the following Indian Naval Ships has completed the hydrographic surveys in Sri Lanka? INS Darshak of the Eastern Naval Command which has been on a two-month deployment to Sri Lanka has successfully completed surveys of Weligama Bay and Southern coast of Sri Lanka. The result of the surveys was formally handed over by Captain Peush Pawsey, Commanding Officer, INS Darshak to Vice Admiral RC Wijegunaratne, the Commander of Sri Lanka Navy, in a ceremony held in Colombo on 12 May 17. The survey operations were undertaken in three phases and ship also visited Colombo and Galle harbour. The ship and ship’s survey motor boats fitted with multi-beam systems were extensively deployed and the hydrographic survey data for more than 7000 nautical miles was collected. Ship’s integral Chetak helicopter also participated in the operations. INS Darshak has the unique distinction of having surveyed in Mauritius, Seychelles, Myanmar, Mozambique and Tanzania in the last few years. The successful completion of the maiden Joint Hydrographic survey with Sri Lanka Navy marks a new beginning in the bilateral relations. I. PCV protects children against severe forms of the pneumococcal disease, such as pneumonia and meningitis. II. Currently, the vaccine is being rolled out to approximately 21 lakh children in all the states of the country in the first phase. The Ministry of Health and Family Welfare has launched the Pneumococcal Conjugate Vaccine (PCV) under Universal Immunization Programme (UIP). PCV protects children against severe forms of the pneumococcal diseases, such as pneumonia and meningitis. Currently, the vaccine is being rolled out to approximately 21 lakh children in Himachal Pradesh and parts of Bihar and Uttar Pradesh in the first phase. This will be followed by the introduction in Madhya Pradesh and Rajasthan next year, and eventually, be expanded to the country in a phased manner. Pneumococcal disease is the leading cause of vaccine-preventable deaths in children under five years of age globally and in India. India accounts for nearly 20% of global pneumonia deaths in this age group. In 2010, pneumococcal pneumonia accounted for approximately 16% of all severe pneumonia cases and 30% of pneumonia-related deaths in children under- five years of age in India. Introducing PCV, therefore, will substantially reduce disease burden in the country. I. The proposed MoU would strengthen the relationship between India and Australia for building peace and stability in the region through exchange of information, expertise, experience and capacity building. II. It is true that MoU is not considered as an effective framework to deal with all issues requiring interaction and cooperation in the areas identified. The Union Cabinet has given ex-post facto approval to the Memorandum of Understanding (MoU) between India and Australia on Cooperation in Combating International Terrorism and Transnational Organized Crime. The proposed MoU would strengthen the relationship between India and Australia for building peace and stability in the region through exchange of information, expertise, experience and capacity building. The MoU is an effective framework to deal with all issues requiring interaction and cooperation in the areas identified. The mutual cooperation would facilitate the institutional interactions between the two countries. The MoU, once in force, would help in curbing combating International Terrorism and Transnational Organized Crime. 12. Recently, which of the following countries has officially offered support for various ongoing as well as upcoming development and infrastructure projects in the North-Eastern region? Japan has officially offered support for various ongoing as well as upcoming development and infrastructure projects in the North-Eastern region. The Ambassador of Japan to India has conveyed his government’s inclination to invest in Northeast and also offer any other feasible support for new ventures. The preferred States which the Government of Japan looks forward to investing in Northeast are Assam, followed by Manipur and Nagaland. I. The objective of the Maternity Benefit Program is to provide partial compensation for the wage loss in terms of cash incentives so that the woman can take adequate rest before and after delivery of the first living child. II. The cash incentives provided would lead to improved health seeking behaviour amongst the Pregnant Women and Lactating Mother (PW&LM) to reduce the effects of under-nutrition namely stunting, wasting and other related problems. III. The Maternity Benefit Program which now has been extended to all districts of the country w.e.f. 1st January 2017 earlier which was limited to Delhi/NCR. The Union Cabinet has given ex-post facto approval to Pan-India implementation of Maternity Benefits Program which now has been extended to all districts of the country w.e.f. 1st January 2017. The total cost of the proposal for the period from 01.01.2017 to 31.03.2020 including Central and State Government share isRs.12, 661crore. The government of India’s share during the period 01.01.2017 to 31.03.2020 comes to around Rs. 7932 crore. I. Coal available to all Power Plants in transparent and objective manner. II. Auction to be made the basis of linkage allocations to IPPs; cheaper and affordable power for all. III. The Stress on account of non-availability of linkages to Power Sector Projects shall be overcome. Cabinet has approved the signing of Fuel Supply Agreement (FSA) with Letter of Assurance (LoA) holders of Thermal Power Plants(TPPs) - fading away of the existing LoA-FSA Regime and Introduction of a New More Transparent Coal Allocation Policy for Power Sector, 2017-SHAKTI (Scheme for Harnessing and Allocating Koyala (Coal) Transparently in India). • Auction to be made the basis of linkage allocations to IPPs; cheaper and affordable power for all. • The Stress on account of non-availability of linkages to Power Sector Projects shall be overcome. Good for the Infrastructure and banking Sector. • PPA holders to reduce tariff for linkage; the Direct benefit of the reduced tariff to Discom/consumers. I. The Convention implements two minimum standards relating to prevention of treaty abuse and dispute resolution through Mutual Agreement Procedure. II. The Convention will function in the same way as an Amending Protocol to a single existing treaty, which would directly amend the text of the Covered Tax Agreements. III. The Convention ensures consistency and certainty in the implementation of the BEPS Project in a multilateral context. The Convention implements two minimum standards relating to prevention of treaty abuse and dispute resolution through Mutual Agreement Procedure. The Convention will not function in the same way as an Amending Protocol to a single existing treaty, which would directly amend the text of the Covered Tax Agreements. Instead, it will be applied alongside existing tax treaties, modifying their application in order to implement the BEPS measures. The Convention ensures consistency and certainty in the implementation of the BEPS Project in a multilateral context. The Convention also provides flexibility to exclude a specific tax treaty and to opt out of provisions or parts of provisions through the making of reservations. The Convention has been opened for signature as on 31st December 2016 and a first joint signing ceremony is scheduled to be held in Paris on 7th June 2017. Signature is the first step in the process of expressing consent to be bound by the Convention, which will become binding only upon ratification. A list of Covered Tax Agreements, as well as a list of reservations and options chosen by a country, are required to be made at the time of signature or when depositing the instrument of ratification. The Annual Joint Humanitarian Assistance and Disaster Relief (HADR) Exercise involving multiple agencies and being conducted by Indian Navy’s Western Nava Command commenced at Naval Station Karwar on May 18, 2017, with an inaugural session. Named as "KARAVALI KARUNYA", the exercise, which involves both professional exchange and actual disaster response mechanisms is set on a Tsunami disaster scenario and will continue till 20 May 2017. I.The Agreement will help in the availability of relevant information for the prevention and investigation of Customs offences. II.The Agreement is also expected to facilitate trade and ensure efficient clearance of goods traded between the countries. The Union Cabinet chaired by the Prime Minister Shri Narendra Modi has given its approval for signing and ratifying, an Agreement between India and Tajikistan on Cooperation and Mutual Assistance in Customs Matters. The Agreement will help in the availability of relevant information for the prevention and investigation of Customs offences. The Agreement is also expected to facilitate trade and ensure efficient clearance of goods traded between the countries. The Agreement would provide a legal framework for sharing of information and intelligence between the Customs authorities of the two countries and help in the proper application of Customs laws, prevention and investigation of Customs offences and the facilitation of legitimate trade. The Agreement takes care of Indian Customs' concerns and requirements, particularly in the area of exchange of information on the correctness of the Customs value declared the origin of goods and the tariff classification of the goods traded between the two countries. 18.Recently, the negotiations on the proposed Mutual Legal Assistance Treaty (MLAT) in Criminal Matters have been held with which of the following countries? The negotiations on the proposed Mutual Legal Assistance Treaty (MLAT) in Criminal Matters between India and Belgium were held on 18 May 2017. The Belgium delegation was led by Mr Steven Limbourg, General Counsellor & Head of the Directorate-III Criminal Law of the Directorate General Legislation, Fundamental Rights & Freedoms, FPS Justice, while the Indian delegation was led by Bipin Mallick, Additional Secretary, Ministry of Home Affairs. I.The key focus areas of the program would aid in preparing India's technological and product development capabilities in the biopharmaceutical sector to a level that it is globally competitive over the next 10-15 years. II.Total project cost to be funded by Government of India is Rs. 1500 crore for five years and the 50% cost for the Mission Programme will be arranged through the World Bank loan. III.For the implementation, a Programme Management Unit will be set up at BIRAC which will work as an operational and functional arm that oversees and monitors program implementation and progress. The Cabinet Committee on Economic Affairs has given its approval for Industry-Academia Collaborative Mission for accelerating discovery research to early development for biopharmaceuticals - "Innovate in India (13) empowering biotech entrepreneurs & accelerating inclusive innovation" to be funded by the Government of India. The Mission will be implemented by Biotechnology Industry Research Assistance Council (BIRAC) - a Public Sector Undertaking of Department of Biotechnology (DBT). The Mission Program would be a Pan-India program. The key focus areas of the program would aid in preparing India's technological and product development capabilities in the biopharmaceutical sector to a level that it is globally competitive over the next 10-15 years and will transform the health standards of India's population through affordable product development. Total project cost to be funded by Government of India is Rs. 1500 crore for five years. 50% cost for the Mission Programme will be arranged through the World Bank loan. For the implementation, a Programme Management Unit will be set up at BIRAC which will work as an operational and functional arm that oversees and monitors program implementation and progress. The Mission will focus on Development of specific products - vaccines, biotherapeutics, medical devices and diagnostics; establishment of shared infrastructure and facilities; building and strengthening domain specific knowledge and management skills; creating and enhancing technology transfer capabilities in public and private sector. I.This Project will bring about substantial economies of scale and maximise cost and time efficiencies by adopting fleet mode for execution. II.The Cabinet’s decision reflects the Government’s commitment to prioritise the use of clean power in India’s energy mix, as part of low-carbon growth strategy and to ensure long-term base load requirement for the nation’s industrialisation. In a significant decision to fast-track India’s domestic nuclear power programme, and give a push to country’s nuclear industry, the Union Cabinet chaired has given its approval for construction of 10 units of India’s indigenous Pressurized Heavy Water Reactors (PHWR). The total installed capacity of the Plants will be 7000 MW. The 10 PHWR project will result in a significant augmentation of nuclear power generation capacity. India has current installed nuclear power capacity of 6780 MW from 22 operational plants. Another 6700 MWs of nuclear power is expected to come on-stream by 2021-22 through projects presently under construction. As the government marks three years of its nation and people-centric governance, in a first of its kind project for India’s nuclear power sector, the ten new units will come up in the fleet mode as a fully home-grown initiative. It would be one of the flagship “Make in India” projects in this sector.